With no audio, 92% (33/36) of respondents indicated their 1st choice to classify the demonstrated technique was Articulatory or Still Technique. 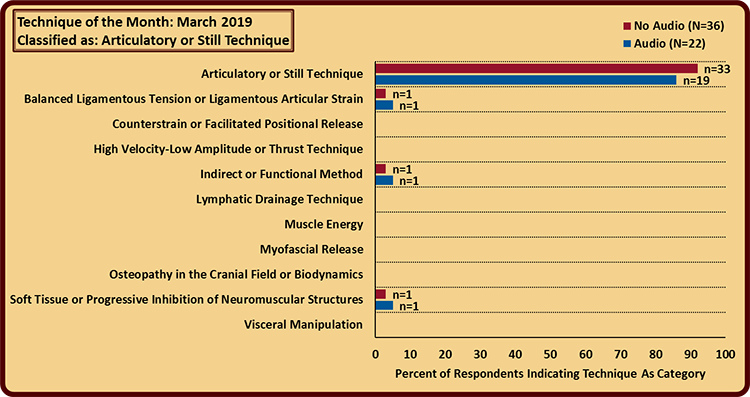 The remaining 3 respondents indicated their 1st choice was Balanced Ligamentous Tension or Ligamentous Articular Strain, Indirect or Functional Method, and Soft Tissue or Progressive Inhibition of Neuromuscular Structures. 97% (35/36) of respondents indicated their 1st, 2nd, or 3rd choice was Articulatory or Still Technique. With audio, 86% (19/22) of respondents indicated their 1st choice to classify the demonstrated technique was Articulatory or Still Technique. The remaining 3 respondents indicated their 1st choice was Balanced Ligamentous Tension or Ligamentous Articular Strain, Indirect or Functional Method, and Myofascial Release. 91% (21/23) of respondents indicated their 1st, 2nd, or 3rd choice was Articulatory or Still Technique. 47% (17/36) of respondents indicated that they currently use Articulatory or Still Technique in their practice. What did respondents have to say when they learned the technique demonstrator classified the technique as Articulatory or Still technique? Did you miss your chance to review the March 2019 Technique of the Month video? Check it out and see whether you agree that the technique demonstrated falls into the category of Articulatory or Still Technique. 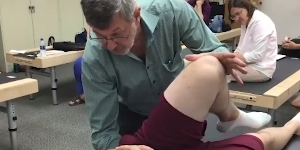 Our thanks to Kenneth Lossing, DO for demonstration this Technique of the Month and to our volunteer patient, Zane Starks! What do you think about the classification of this demonstrated technique as Articulatory or Still Technique? Let’s talk about this below!